Sand Villa is a mid terraced sandstone building within easy walking distance from all amenities. Sports hall, ferry terminal, train station/bus station. Award winning seafood restaurants. We also have our famous malt whisky distillery which is part of the six classic malts. Sandvilla has 4 ensuite rooms 1 twin with a private bathroom the single is only let in conjuction with the twin room. All rooms are to a high standard with tv's tea/coffee. The dinning room is on the ground floor. Parkig is to the rear. 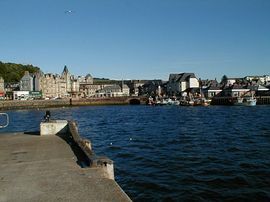 Oban is only 2.5 hours from Glasgow airport, 3 hours by train/bus. Oban is the gateway to the isles, and a sail is a must do, as the scenery to these isles is breathtaking. Easy walking distance to the town. By car from Glasgow, on entering Oban you will come down a hill into Oban, this is the main road into town, as you come down this hill you will see a hotel on the left called the KingsKnoll take the first on the left, after this hotel, you will then come to a cross road, take the right turn after 200 meters you will see Sandvilla guesthouse. By train/bus the best/easiest is by taxi. 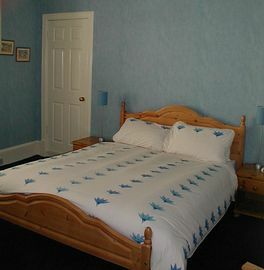 Tariff is £27.00 per person per night in high season and £25.00 at low season. High season is from Easter to September.